Episode 62 Bonus! - Terri and Jacqueline talk with Anne Cocquyt of The Guild about Serendipity, her annual un-conference held in San Francisco in October. Terri and Jacqueline talk with Anne Cocquyt of The Guild about Serendipity, her annual un-conference for women held in San Francisco over two days on October 26th and 27th. Anne shares why she started Serendipity and the plans for this year’s event..
Terri, Jacqueline and Anne talk about Serendipity. Serendipity is anything but the typical conference. There will be more than 80 speakers sharing their skills and expertise. Attendees are limited to 500 women. Terri talked about the salon she is hosting at Serendipity at Bolt VC for female accredited investors to learn more about investing in startups. This will be limited to 40 female accredited investors. There are 40 different sessions and each attendee can choose 4 different sessions over the two days. Everyone will have a different, tailored experience but will be able to have a shared experience and connect with other women. There will be an opportunity to fill out your Guild profile, connect with women before the event, and then have a 15-minute call to help determine which sessions to attend. There will be happy hour on night one and the second night, there will be dinners hosted by various community members including discussions. You must buy a dinner ticket and a session will be recommended based on your interests. Anne is looking for volunteers to help with the conference who want to contribute to the event and participate on a very, special level. Anne can be reached through The Guild website www.letsguild.com or via email at anne@letsguild.com. Or through the Serendipity website: www.guildserendipity.com. 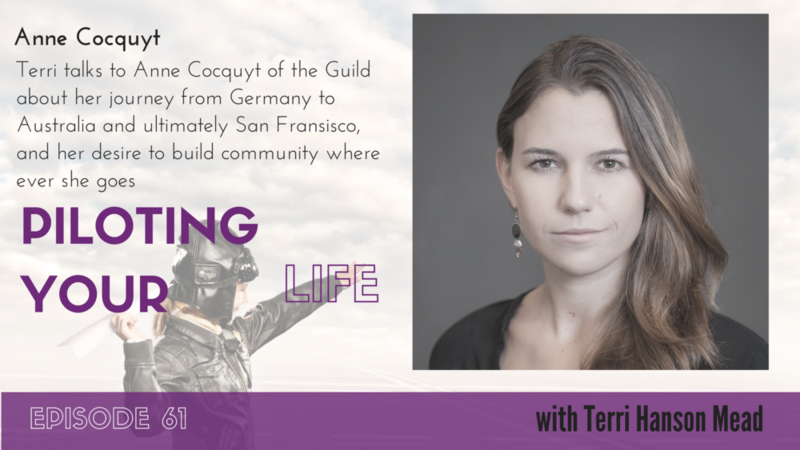 Episode 61 - Terri talks to Anne Cocquyt about her journey from Germany to Australia to Europe to South America and ultimately San Francisco and her desire to build community wherever she goes. Terri talks to Anne Cocquyt about the importance of building community and growing through travel. Anne also talks about being an adrenaline junky which has fueled her big leaps from Germany to Australia to Europe to South America and ultimately San Francisco to start her company, The Guild. Anne Cocquyt is originally from Germany where she studied computer sciences and got her undergrad and master’s degree. She left Germany for Australia and ultimately landed in Switzerland where she started her career in the IT industry for Detecon Switzerland leading multi-million-dollar IT outsourcing projects across Europe and Asia with clients like Philips, Shell and Deutsche Telekom. She launched her first NGO in Switzerland, organizing high-end events to fundraise for charitable projects in Zambia, South America and Switzerland. She then ventured into the business of art, which she discovered was not her forte, before launching her own IT strategy consultancy company in the UK and Switzerland. After some time on Route 66, she got married, moved to San Francisco, and joined Genentech managing the execution of 12,000 educational programs and then leading commercial partnerships all the while advocating and implementing digital health innovation across the company. Simultaneously, she founded and sold a small consumer product company, Bezl LLC. In 2016, Anne decided to take the leap and transform her knowledge in data science, her commitment to women leaders and her close connections to the entrepreneurial ecosystem in Silicon Valley to support her new venture: The GUILD. Anne shares her journey from Stuttgart, Germany which was fairly conservative, and she knew she wanted to get out into the world. After she finished her MBA, she booked a trip to Australia which was on the other side of the world from where she was living. While in Australia, she worked a number of odd jobs until she realized that she needed to get back into the real world. She moved into IT transformation consulting out of Switzerland. The work ultimately didn’t align with her values so she started a non-profit organization with a friend and put on large, high-end events for fundraising for organizations or projects they cared about. Anne shared her grandparents’ story that influenced how she operates in the world in terms of the importance of building community. Her grandmother was pushed out and she had to create a new home. Anne decided to find her own home. Anne shared her journey through South America and how traveling taught her that whenever she thought she was at the end, or that she was stuck, that there are ways out. She learned to trust in herself and in serendipity. Terri talked about the importance of traveling and putting herself in uncomfortable positions to build resilience, adaptability, and self-reliance. Anne says new is scary, but this doesn’t seem to hold her back. Anne believes that networks are so important. When she was in South America, she got a call to do a consulting project in Europe. She started a company in England and Switzerland to support the project. Anne came to America and rented a red convertible to drive Route 66 to drive west which turned out to be her route to freedom. She felt like there was something waiting for her at the end of it. She ended up in LA with a friend and two months later she was married and living in San Francisco. Anne talked about being new to the area and knowing absolutely no one. She attended lots of events to meet people but knew that there were a lot of people in the groups that had something in common. She started connecting them and realized that she had a passion for something that feels really good. She started a consumer product company as a side hustle with her husband and started working for Genentech. She saw there was no support system in place for women, so she started Bubbles and Biz. Her experience at Genentech focused on neural networking led to an idea to create an algorithm to find the ways that people connect leveraging AI. She took her hypothesis tested it out. Anne quit her job at Genentech and took the leap to create the Guild. She recently added video chat options to the in-person meeting options. They now have members from almost all states on the platform. Terri asked about who the ideal Guild member is, and Anne responded that it is any women from 18-90. The algorithm considers many aspects of a woman’s life and interests and so it is not limited to professional women. It can help other groups help their community members connect with each other and help companies connect their employees to each. Terri talks about the importance of the women’s groups and organizations coming together to build a stronger, collective force. If Anne could wave a magic wand, she would have people take a moment, before they do or say anything, to think about the effect of their actions on other people. Hello Alice is a great resource, especially for female founders. She also recommends taking a look at founder groups including the former YC group on Facebook and Founder Network. New is scary but it shouldn’t hold you back. Anne can be reached by email at anne@letsguild.com or through The Guild website at http://www.letsguild.com.